The share of online Americans who said the internet has greatly improved their ability to shop doubled—from 16% in March 2001 to 32% in December 2005. The share of online Americans who said the internet has greatly improved the way they pursue hobbies and interests climbed from 20% in March 2001 to 33%. The share of online Americans who said the internet has greatly improved their ability to do their job rose to 35%, up from 24% in March 2001. So what’s going on here? Does the internet matter less for health than it does for finding that one-of-a-kind iPod case you’ve been hunting for? The short answer is: it depends on your personal situation. Many Americans are deepening their connections to the internet, whether for entertainment or to help a loved one through a crisis. And while the audience for the latest DVD may be larger than the audience for clinical trial information, the impact on someone’s life in the latter case may be dramatically different in scale. 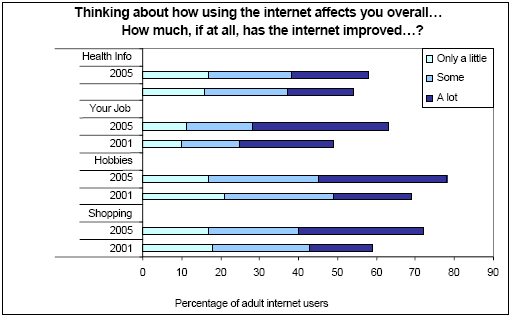 Source: For 2005 data, Pew Internet & American Life Project November-December 2005 Tracking Survey, n=1,931 adult internet users, 18 and older. Margin of error is plus or minus 2 percentage points for results based on internet users. For 2001 data, Pew Internet & American Life Project March 2001 Longitudinal Callback Survey, n=862 adult internet users, 18 and older. Margin of error is plus or minus 4 percentage points for results based on internet users. 36% of e-caregivers said the internet helped them find advice or support from other people. 34% of e-caregivers said the internet helped them find professional or expert services. 26% of e-caregivers said the internet helped them find information or compare options. Just 6% of e-caregivers reported getting from the internet either bad information or advice that made their experience more difficult. By comparison, 91% of e-caregivers said that was not a problem for them. Moreover, the internet often played a major role for e-caregivers. When asked about all of the different sources of information they used, 58% of e-caregivers said the most important source was something they found on the internet. Only 38% said the most important source was one they found offline. This wide range of topics and sources illustrates how powerful a tool the internet can now be for those seeking needed information relating to health and health care. The range of sources extend from in-depth research on medical diagnosis and treatment, expert opinions on specific conditions, access to communities of like-minded individuals, and advice on treatment and adjustment options. And while many will not need access to that information at any given time, there is clearly a growing population that considers the internet to be a crucial resource.